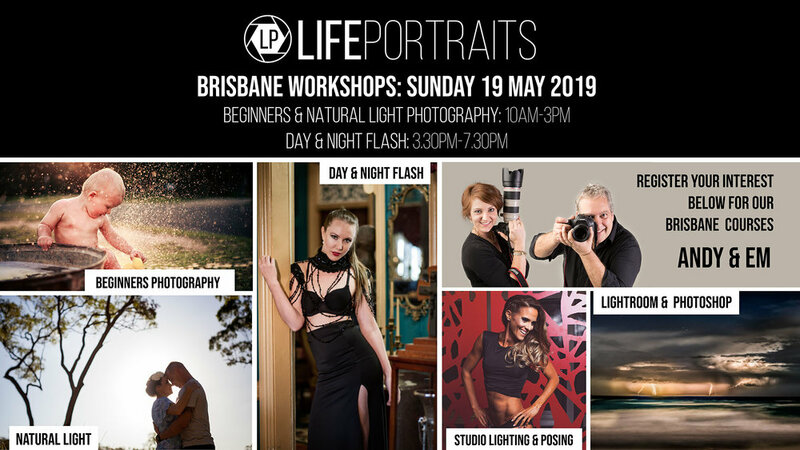 LIFE PORTRAITS IS RUNNING A BRISBANE PHOTOGRAPHY WORKSHOPS DAY ON SUNDAY 19 MAY 2019 FEATURING IN DEPTH TRAINING IN BEGINNERS PHOTOGRAPHY, NATURAL LIGHT AND DAY AND NIGHT FLASH. By the end of the day course attendees will understand; manual, aperture priority & shutter priority settings on their cameras; when & how to use them; how to master the aesthetics of their images to create impactful photographs; take images in a variety of natural lighting conditions; how to use light modifiers; how to position their subject to the sun; how to use on-camera flash indoors and outdoors, in day and night situations; how to create different styles of lighting and changing the aesthetics of your image. Attend all courses, 9 hours of in depth training, including the beginners photography & natural light combined course & day and night flash for just $400. Save $50 by signing up for both. Online Sign up: Please sign up for the workshops via the signup form below. We have a section for the full day package discount, as mentioned above. If you have any questions please feel free to contact us. Sign-up via email and invoice: If you have any difficulties with the sign-up below, please send us an email to info@lifeportraits.photography detailing the courses you wish to sign up for and we can create an invoice for you to pay via bank transfer. Your details will be sent to us and we will contact you soon about the finer details of the workshops. To find out more about the workshops on offer, see below the sign up form. This workshop is designed to introduce you to the concepts of ISO, aperture and shutter speed, how they relate to each other, the effects they have on your image and how you can use them to unlock the full potential of your camera and your imagination to truly launch you on your photographic journey. Attendees will learn how to use their natural surroundings to help shape and control light when they have no control over the actual light itself (i.e. ambient or sunlight). 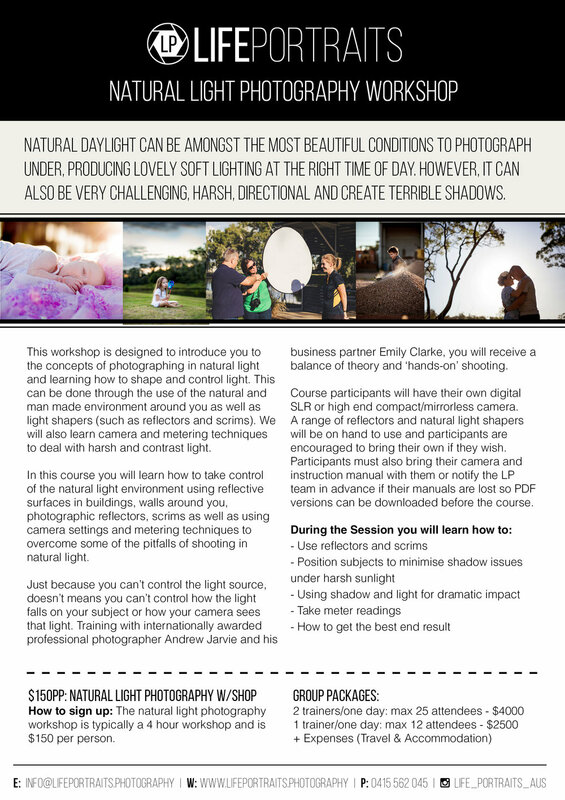 Attendees will learn how to use natural light shaping tools such as reflectors and scrims as well as using their surroundings, walls, shadow zones etc to create interesting and different effects using only ambient light. Key outcomes: Attendees will be able to produce memorable images and excellent results in even the most challenging lighting situations allowing them work at any time during the day and in both harsh and gently lighting situations. Many people consider flash photography too tricky or difficult to learn or find the light too harsh and glaring. In most instances, hotspots and over exposure through the use of flash is often simply down to a lack of understanding. During the session you will learn when and how to use your flash in a variety of situations and light levels from full daylight to night, banish the shadows forever with a simple guide to using fill flash, balancing foreground and background light, how on camera flash can change your image, compensating flash output to achieve accurate white balance and much more. The product photography with your smart device workshop is designed to help small businesses & sole traders, who may not have easy access to professional photography services or equipment, to understand the principles of product photography; learn how to set up a working product studio with simple items found around the home; and how to use their smart devices/professional camera to create impactful photography for print or online marketing. The course will cover aesthetics, styling, lighting, product vs lifestyle photography, basic processing on their smart devices and getting attendees to think differently about their images for sales/marketing. A big thank you to Queensland Small Business Week and Queensland Government for their support in this workshop. 9am-9.30am: The basics of product photography: the different forms of product photography – lifestyle or stock, the principles of lighting, angle of shot, displaying your product at its best; styling. 1pm-2pm: Practical time – Setup a mini studio, take shots using apps shown and then we will go through some editing on the apps. Apps – Photoshop fix etc and Adobe editing programs on phone. Deep etching – how to put objects on a white or transport background. 2pm-3pm: Social media + Wrap up with questions – Using Instagram and Facebook (scheduling, content generation, hashtags), creating a personal brand. Attendees must bring their camera/smartphone/ipad for the course, a notepad and laptop if they wish. Those who work with smaller products are also invited to bring them to use as subjects. We will be providing a light platter of fruit at morning tea and some a savoury platter at lunch, but please feel free to bring your lunch or snacks on the day. You can register for the event below. You will be prompted to pay your $25 admission on registration and we will ask you a few questions about why you are attending the workshop. If you have any questions, please feel free to contact us on info@lifeportraits.photography or call Andy on 0415 562 045 or Em on 0423 082 039. LIFE PORTRAITS IS RUNNING A MORANBAH PHOTOGRAPHY WORKSHOPS DAY ON SATURDAY 1 JUNE 2019 FEATURING IN DEPTH TRAINING IN BEGINNERS PHOTOGRAPHY, NATURAL LIGHT AND DAY AND NIGHT FLASH. Life Portraits are having a Brisbane Studio Day on Monday 11 March! We have 7 openings left for 30 minute mini sessions for clients to experience a studio photoshoot. Our 30 minute sessions include 10 high resolution images for $400, with the option for upgrades on the appointment setter. You can book and secure your time below. 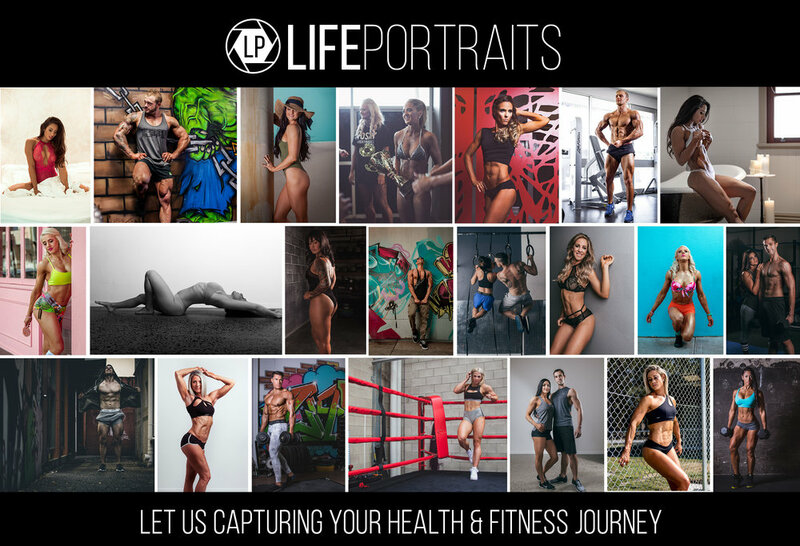 If you have any questions please feel free to send us an email at info@lifeportraits.photography and feel free to check out our instagram pages @lifeportraits_fitness (fitness page), @life_portraits_aus (our portrait & commercial page). Thanks to the lovely team at Fox Street Studio for this great space! See more here. LIFE PORTRAITS IS RUNNING A SERIES OF TRAINING WORKSHOPS IN SARINA, QLD FROM SATURDAY 2 FEBRUARY - SUNDAY 3 FEBRUARY. By the end of the weekend, course attendees will have learned how to; take images in studio; how to setup a studio, understand the concepts of aperture and how it relates to studio lighting; how to pose their subjects'; how to use on-camera and off-camera flash indoors and outdoors; how to create different styles of lighting and changing the aesthetics of your image. Those attending day two will learn about post-production workflows and how to use two of the main processing software packages of the photographic industry, Lightroom and Photoshop to process portraiture, landscape and composite images. Our base location for the workshops will be Sarina Darts Association with hands on training being done around Sarina. Online Sign up: Please sign up for the workshops via the below signup form. As per above, we have discounts for purchasing all of day 1 workshops & both day 1 and day 2 workshops, which is specified below as options. If you have any questions please feel free to contact us. Sign-up via email and invoice: If you have any difficulties with the sign-up below, please feel free to email us on info@lifeportraits.photography with the courses you wish to sign up for and we can create an invoice for you to pay via bank transfer. To get the best out of the studio environment you have to understand the concepts of light. Studio photography isn’t just about the various light shapers and settings on your studio flash, but how light falls. Understanding studio photography involves knowing how to move your lights and your subject to create vastly different effects and how to create differing areas of lighting to add drama and emotion to your images. During this course we will spend an initial period working through the theory of studio photography including; learning that shutter speed no longer matters; learning how to work with aperture and power settings on flash units to control exposure; and learning how to position the light to create different lighting zones having control over the colour of your background. During the practical side of the session we will set up a studio and explore the vast results that can be achieved from the simplest of single light set ups through to two lights and more complicated three light setups. We will also delve into how to construct a studio and explore the effects and usage of various lighting shapers including soft boxes, beauty dishes etc. During the session you will learn when and how to use your flash in a variety of situations and light levels from full daylight to night, banish the shadows forever with a simple guide to using fill flash, balancing foreground and background light, how on camera and off camera flash can change your image, compensating flash output to achieve accurate white balance and much more. This workshop is designed to get you up and running with Adobe Lightroom and Photoshop in just one day. Both of these programs are the industry standard for post production of images today. In particular, what most people don’t realise is that Lightroom is so much more than a piece of processing software, it’s a complete image management and filing system. The course will teach you the introduction to Lightroom, how it works, setup, importing, exporting, the develop module and it’s tools and advanced processing with going out of Lightroom into Photoshop. When concentrating on Photoshop, we provide a full introduction to the basic Photoshop tools for photographers. The key topics are based around Photoshop and its relationship with Lightroom, which to use, when and how to make them work together to supercharge your image editing. Our course is designed as an overview of how to work with the software to make it the very hub of your post production workflow. WITH CHRISTMAS FAST APPROACHING, IT’S THE PERFECT TIME TO GET THE FAMILY TOGETHER FOR A PHOTOSHOOT! Brisbane's Life Portraits is coming to Tenterfield and we would LOVE to capture your family or loved ones with the beautiful Tenterfield scenery as your backdrop. We are also offering one-on-one photography training in any topics neccessary ($80/hour, 2 hour minimum). Business owner, Emily, will be travelling to the region once every couple of months due to her partner working in the area and wanting to offer our personalised photoshoots and photography training to the region. Life Portraits create beautiful imagery that is customised to each individual, family or couple. We love to know all about your hobbies, favourite places to go, your families characteristics and incorporate these into your photography session. We make your photoshoot fun, enjoyable and an experience to remember - you just have to look at our consistent 5 star rating on our facebook page. We will be offering family, couples, children, maternity and fitness sessions as well as one-on-one photography training over the period of Monday 19 November-Thursday 22 November in Tenterfield. If you are interested in booking in please register below and we will be in contact soon to offer bookings. We have a range of packages to suit the needs of all of our clients, see our packages below or download our information HERE and our photographing one-on-one training is $80/hour capped at a 2 hour minimum. If you haven't already, check out our website for some examples of our work: www.lifeportraits.photography and for our workshops and training see www.lifeportraits.photography/lp-training-1/ If you have any further questions, don't hesitate to contact us at info@lifeportraits.photography or on our contact page. Choose one or more of the options that work for your family/loved ones. We will offer a booking calendar at a later date with options for you to secure a date and time. Where in Tenterfield would you like your photoshoot to be? Any additional notes for us? LIFE PORTRAITS IS RUNNING A SERIES OF TRAINING WORKSHOPS IN CLERMONT, QLD FROM SATURDAY 17 NOVEMBER - SUNDAY 18 NOVEMBER. By the end of the weekend course attendees will understand the manual, aperture priority and shutter priority settings on their cameras, when and how to use them, how to take control of the aesthetics of their images, take images in a variety of natural lighting conditions, how to use light modifiers to enhance your image, how to position your subject to the sun and much more. They will also have an understanding of post-production workflows and how a working knowledge of two of the most popular processing software packages in the photographic industry, Lightroom and Photoshop. Attend both Day 1 and Day 2 courses (16 hours of in depth training) including beginners photography, natural light and post production for just $500 (saving $150 over individual course costs). Online Sign up: Please sign up for the workshops via the signup form below. As per above, we have a section of package discounts. If you have any questions please feel free to contact us. In particular, what most people don’t realise is that Lightroom is so much more than a piece of processing software, it’s a complete image management and filing system. The course will teach you the introduction to Lightroom, how it works, setup, importing, exporting, the develop module and it’s tools and advanced processing with going out of Lightroom into through Photoshop. When concentrating on Photoshop, we provide a full introduction to the basic Photoshop tools for photographers. The key topics are based around Photoshop and its relationship with Lightroom, which to use, when and how to make them work together to supercharge your image editing. Brisbane's Life Portraits are coming to Tenterfield and we would LOVE to capture your family or loved ones with the beautiful Tenterfield scenery as your backdrop. Business owner, Emily, will be travelling to the region once every couple of months due to her partner working in the area and wanting to offer our personalised photoshoots to the region. We will be offering family, couples, children and maternity sessions over the period of Thursday 23 August-Sunday 26 August in Tenterfield. If you are interested in booking in please register below and we will be in contact soon to offer bookings. We have a range of packages to suit the needs of all of our clients, see our packages below or download our information HERE. If you haven't already, check out our website for some examples of our work: www.lifeportraits.photography. If you have any further questions, don't hesitate to contact us at info@lifeportraits.photography or on our contact page. How to sign up: The beginners photography course is typically a 6 hour photography and is $200 per person. Please register your interest below for Sunday 24 June from 9am-3pm to be held at the Mount Cooth-tha Botanical Gardens. We keep our workshop numbers limited to ensure each attendee gets personal attention with owners Andy & Em. This course is designed to introduce you to the concepts of ISO, aperture and shutter speed, how they relate to each other, the effects they have on your image and how you can use them to unlock the full potential of your camera and your imagination to truly launch you on your photographic journey. In this beginner course we will spend the first 2-3 hours on theory and then go out and put into practice what we have learnt and offer you support and guidance with one-on-one assistance to answer any questions. Click on the image below to learn more about what we teach and what you will learn on the course. We look forward to meeting you all and joining us on your personal photography journey. If you have any questions please feel free to email us HERE. Please register below for your spot on the course. Attendees will learn how to use their smart device or professional camera to create impactful photography for marketing. We will cover aesthetics, angles, depth of field, styling, lighting, product vs lifestyle photography, basic processing on your smart devices and getting our attendees to think differently about their images for sales and marketing. This course combines skills in beginners photography, natural light photography, day and night flash and how to take your photography to the next level. Great for photographers who want to learn how to improve their imagery for their clients and for those that understand photography and want to improve their imagery for their business. Attendees will learn the fundamentals to taking their marketing, social media and digital knowledge to the next level. The course combines business model exercises, social media marketing and scheduling, how to use digital platforms and online tools to help their business and much more. A great workshop for any business, learning some of the key elements to improving their business, automating tasks and excelling in their marketing. Please register your interest below by filling out the questions as this information will help us shape our courses and for our final project submission. What region/community are you from? Please comment your ideas below and we'll do our best to incorporate this. There is no further commitment or payment required at this time we are simply gauging interest so we can organise delivery of the courses over the next few months and also to allow us to seek various grant funding so we can make this courses as cost effective as possible for you. Courses will be limited in numbers and all those who register their interest will be given priority places on the courses on a first come first served basis. Thank you for your assistance and we hope we can bring these courses to the community! To celebrate Fathers Day, OLR P&F and Life Portraits have come together to offer every family at the school the chance to have a professional family portrait session with up to 15 minutes photography time and one full resolution 300 PPI professionally processed image file (capable of being printed at wall art size) for just $15. Life Portraits will have two photographers on site at the after school day care centre and (weather permitting) the adjacent play area. After each session a private gallery of low res images will be uploaded for each family to choose their full res 300ppi digital file of their choice fully processed and print-ready. The chosen digital file will be delivered electronically for download along with a social media ready file of the same chosen image. Examples of items will be available for inspection on the day of the photoshoots. Photography slots will be offered on a first come, first served basis. Payment for each session must be made in advance, all other orders can be made after examination of the products and images. Initially dates for Saturday August 19th will be offered however if these fill up additional times on Sunday August 20th may be offered. For examples of our work please go to the "portfolio" tab above. PLEASE FILL OUT THE REGISTRATION FORM BELOW THEN CHOOSE YOUR TIME. Please Click on August 19th below, choose your time, fill in your personal details and pay for your booking via credit/debit card or PayPal account. Only available times will be shown. Thank you and we look forward to meeting you. Life Portraits in partnership with the Northern Classic Kennel Club would like to offer all who attend the chance to have a free digital Christmas card created with a 5 minute photo session for your dog at the NCKC show day on Sunday 6th August at the Dogs Queensland Sports Grounds, 247 King Avenue, Durack. Booking is essential, simply click on the calendar below and fill out the form to book your time slot. Slots will be offered on a first come first served basis. What you will receive is a free 5 minute sitting for your dog and a digital Christmas card sponsored by Life Portraits and NCKC for your own use. Following your session you will be sent out a web link to choose your favourite image for your free digital card and in addition you may choose to purchase a range of products including Christmas card packages, digital files may also be ordered. Life Portraits are running a series of training workshops for Isaac Coast Photography Society from Saturday 22 July - Sunday 23 July. By the end of the weekend course attendees will be given the knowledge to take images in a variety of natural lighting conditions as well as how to use studio flash, speed lights and work with and pose subjects. They will also have a full understanding of post-production workflows and how to use two of the main processing software packages of the photographic industry, Lightroom and Photoshop. The workshop weekend has been made possible by support from the Regional Arts Development Fund in partnership with Isaac Regional Council, supporting local arts and culture in regional Queensland. As a result of this support the courses are being offered at significantly reduced prices to participants. A workshop in advanced lightroom processing work combined with a brief introduction to Photoshop and how to use Photoshop and Lightroom together to produce stunning results and faster workflows for photographers. Some Lightroom knowledge will be required before attending the course. Key outcomes from this course would be attendees would have the knowledge to design their own workflows, be comfortable working within Lightroom and seamlessly moving between Lightroom and Photoshop. Would have advanced skills in Lightroom including use of all filters and brushes, split toning, ability to create and use presets, full knowledge of the database management side of Lightroom. Attendees will also have a base understanding of the differences between lightroom and photoshop, and understanding of the basic functions of Photoshop as regards images processing and a basic understanding of layers in Photoshop. Attendees will learn how to take complete control over lighting in a studio situation and use a variety of light shapers, studio lights and speed lights to create different moods and emotional responses with an image as well as how to light subjects in a sympathetic way. Attendees will also be taught how a range of classic lighting set ups and also how to pose their subjects to create interesting emotional and flattering poses. Key outcomes would be that attendees will be able to take complete control over their portraiture work and produce well constructed and flattering posed portrait images. Attendees will get a full grounding in how to creatively use speedlight flash guns in both day and night lighting scenarios and to use their flash both for fill light to compliment ambient lighting levels and completely light a scene using flash units. With two instructors on hand the class will be split into a beginners section which will learn how to use a single flash on camera. The fast learning and more advanced photographers in the class will form a second group and learn more advanced techniques to use multiple flash guns and use their speedlights off camera to creating even more interesting lighting scenarios and techniques to help fully unlock their creative potential with their camera and flash lighting. Please sign up for the workshop to the right. Your details will be sent to the event organisers who will contact you re payment. Please tick the workshops that you are registering for and this information will be passed to the ICPS group.